"Unspeakable secrets are hidden within the Forbidden City." Chow Yun Fat and Gong Li star in this riveting and dazzling epic story of redemption, revenge, and betrayal. A family divided against itself will fall. Royal families are not immune to this philosophy. Set in the tenth century, during China's Tang dynasty, the emperor has returned from a series of military tours. His return home is just in time for the chrysanthemum festival. His return is greeted with great respect from his household employees, but his family has been plotting and conspiring. The three sons have their own plans for the future of the royal family. Prince Jai, concerned with his mother, is forced to choose sides between mother and father. Jai's brothers will have to make their own choices. With the festival looming in the near future, will the family resolve issues? Hidden behind the walls of the forbidden city, secrets unfold in this deep and spectacular story. Fatal lines are crossed, blood is shed, and betrayal is redefined. 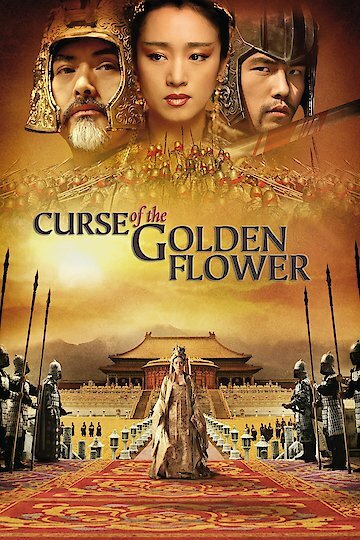 Curse of the Golden Flower is currently available to watch and stream, buy on demand at Amazon, Vudu, Google Play, iTunes, YouTube VOD online.